A New Chart of the World, on Mercator's Projection: Exhibiting the Track & Discoveries of themost Eminent Navigators, to the Present Period. 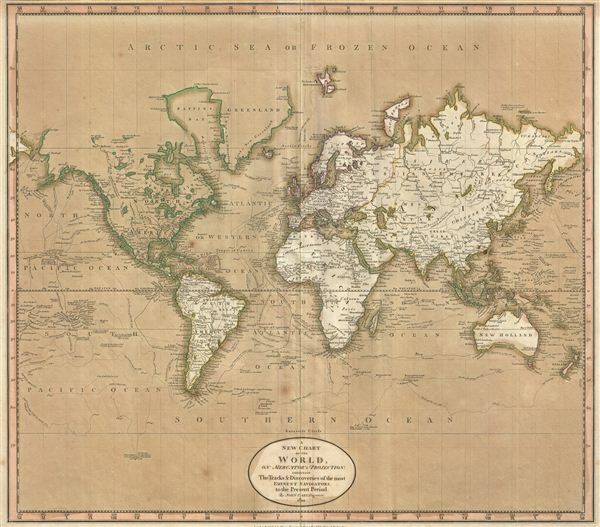 A very nice example of John Cary's wonderful 1801 Map of the World on Mercator's Projection. Details the entire world as it was known at the turn of the 19th century. Displays the continents in considerable detail but offers only minimal information in the Arctic and Antarctic latitudes. Cary designed this map to illustrate the explorations of the previous century, focusing specifically on the important discoveries of Cook, Vancouver, Perouse, and Gores. The map further offers copious notations on explorations and unconfirmed discoveries throughout. Prepared in 1801 by John Cary for issue in his magnificent 1808 New Universal Atlas. Very good conditon. Original centefold. Margins very narrow all around. Oxidized. Rumsey 1657.003. Phillips, P. L., A List of Maps of America in the American Library of Congress, p. 1097. Phillips (Atlases) 714 (Atlas). The Map Collector, issue 43, p. 40-47 (Atlas). National Maritime Museum, v. 3, no. 311 (Atlas).